Riots in the streets. Conflicts spreading like viruses. And a presidential election looming. Looks like it's time to go searching for America again. It's not that we lose America. It's more like we lose track of it. It's especially easy in this days of social media, when you can fine tune your input according to your tastes – then, oh, the shocks when your step out of your comfort zone onto . . . the road. That's where you find the real America, on the road. Huckleberry Finn knew it. So did Jack Kerouac. And Hunter Thompson. And so does John Waters. His latest book, Carsick, is another fine example of the Great American Road Book. 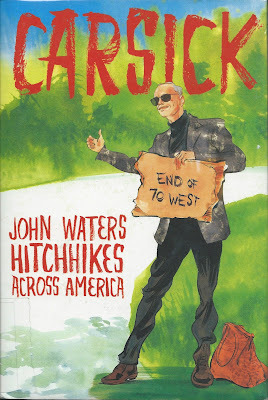 He tells of hitchhiking across America, and more. Carsick is another work of American literature that straddles the borders between fiction and nonfiction. After an introduction, he presents two outrageous novellas: one presenting the best case scenario, the other the worst. Waters' own twisted utopian and dystopian visions. Magnificently outrageous. The kind of stuff that makes you fall in love with America as the fantastic place where anything is possible, the way it should be, if only so many Americans weren't afraid of everything. This gets into speculative fiction territory, crashing through alternative universes and all. Maybe John deserves a Hugo award for this. Then, he goes on to document his real trip. Celebrity hitchhiking in the time of interwebs. Real people that are strange in ways his imagination didn't expect. The amazing, mind-blowing thing is – and I'm fighting the urge to commit spoilers here – it leaves you feeling good, and hopeful about this country. It's the sort of book we need right now. And it makes me once again think of John Waters as a Great American.